This manual was written by bestselling financial author, Dr. Brian Kluth. Over 100 other organizers/planners were researched to create this one-of-a-kind organizer in order to make it the "most comprehensive legacy organizer on the planet". Other similar organizers, but not as complete, often cost $50 to over $200 each. 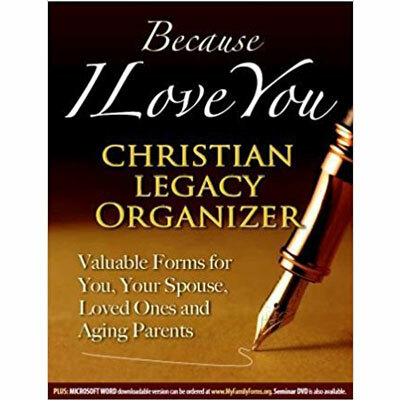 This 40-page Legacy Organizer has forms and lists to cover Household & Family Matters, Finances, Retirement & Medical Issues, End-of-Life Planning, and Estate Planning. Brian Kluth is a bestselling financial author, speaker, media guest, and pastor. Kluth's www.GiveWithJoy.org radio stories and eDevotionals are shared with radio listeners on over 200 stations nationwide. He has been a popular guest speaker for churches and conferences, including NRB, GMA, ECFA, CLA, and Moody Pastors' Conference. He founded the www.MAXIMUMgenerosity.org website and eNewsletter that is sent to over 12,000 pastors and leaders in over 150 countries. Brian lives with his three teenagers in Colorado Springs, CO.